In this series of articles, I am going to step through the various services offered by Azure DevOps for applications developed using NodeJS, Angular and React. I am also going to cover support of Azure DevOps for using Gulp, TypeScript etc. for building these applications. I also assume that you are aware of Azure DevOps and can a create Team Project in your subscription of Azure DevOps. For more information please visit https://visualstudio.microsoft.com/. I am going to use Visual Studio Code on Windows and Git repository on Azure DevOps for version control. Familiarity with these is also assumed. 2. Add the NodeJS app to version control (git repository) of a team project on Azure DevOps. 5. Add a Mocha test (with Chai assertion) and run that after deployment of NodeJS app, as part of release process. 6. 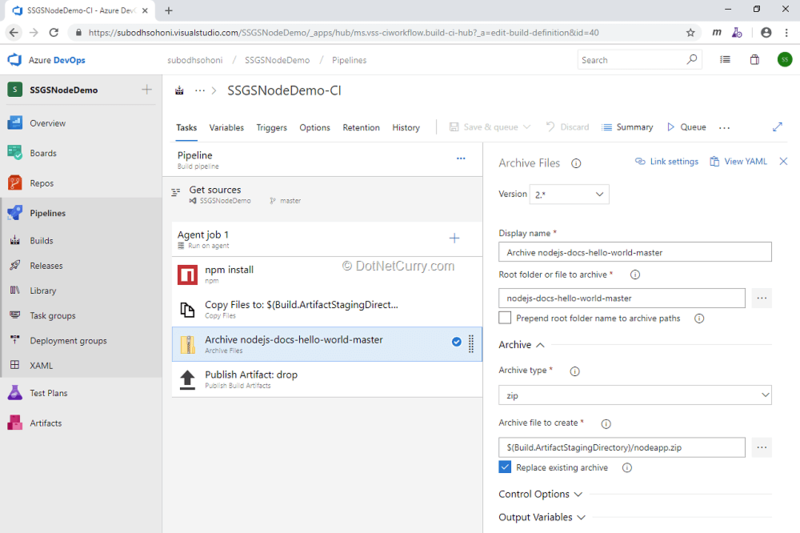 Create a release definition on Azure DevOps that deploys the packaged NodeJS app to the Azure App Service. 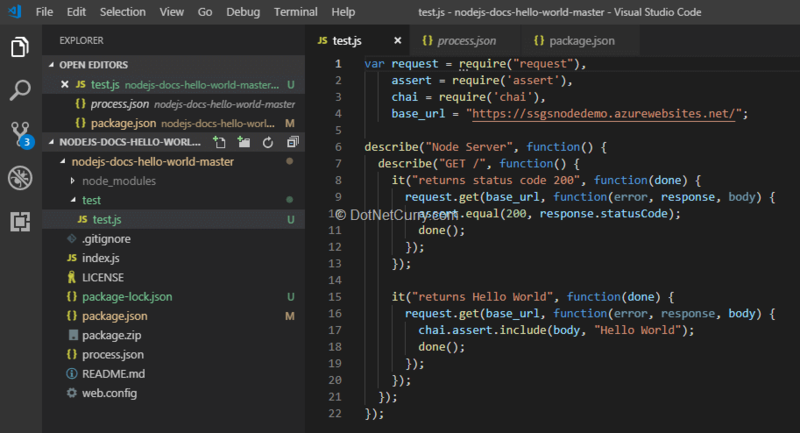 As the first step of this walkthrough, I suggest you to create a simple NodeJS app or download a readymade app from https://github.com/Azure-Samples/nodejs-docs-hello-world. All the code in this walkthrough is from this app. After downloading it, open the app in VS Code. Let’s add that to our Git repository. VS Code ships with a Git source control manager (SCM) extension. We will start by initialization of our local repository and then commit the code to the local repository. To initialize the local repository, click the Source Control icon on the left and then click the git icon. After this, you can select the folder that contains the downloaded Hello World App. You can now commit the app by clicking “Commit all” button, located under the “more actions (…)” button. Enter a comment for the commit, for example: “NodeJS project added”. Login to your Azure DevOps subscription and create a team project. Let’s call it SSGSNodeDemo. Remember to select Git as the source control. This will automatically create a repository when the team project is created. This newly created remote repository will now have to be configured locally. If you don’t have Azure DevOps (Repos) extension installed on VS Code, this is the right time to do so. This forms a link between your local repository and the remote repository. When you push or pull the code, it will be to / from that remote repository. Once the remote/origin is configured, you can push the committed code to that remote repository. If you now refresh the Repos page on your team project, it will show you the code that is pushed to the remote repository. You will be hosting your app on Azure App Service as a web application. You can login to your Azure Account in the portal and create a new Web App. After creating the app, under the Application Settings, add a new setting named WEBSITE_NODE_DEFAULT_VERSION. Give it a value according to your node version, say, 8.9.4. Now our application is ready to run! But it does not have any code to run! When we deploy our NodeJS app, it will run in the IISnode which is the supported node environment on Azure App Service. In practice, this means you’ll need a specific web.config file in your application root folder. Fortunately, this file is already included in the application you downloaded, so you don’t need to worry about that now. You need to package the application as a .ZIP file which can be deployed to your App Service. 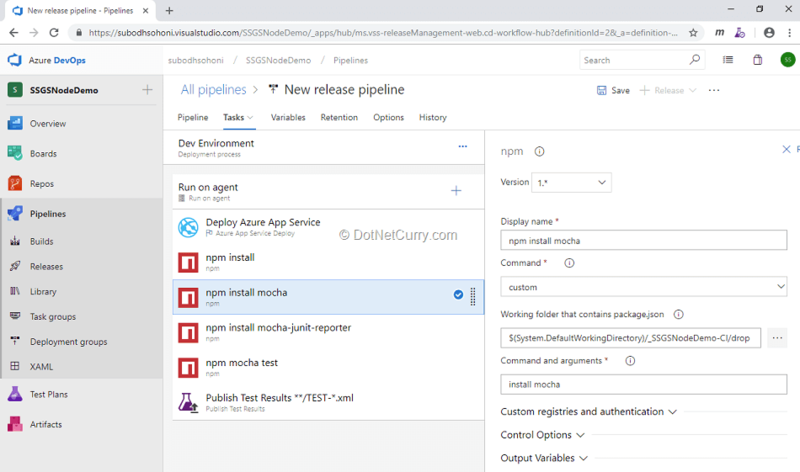 We’ll use the build service of Azure DevOps to create this package and deploy it by using the Release Management service. .
To create a build pipeline in your team project on Azure DevOps, browse to the Pipelines – Builds page. 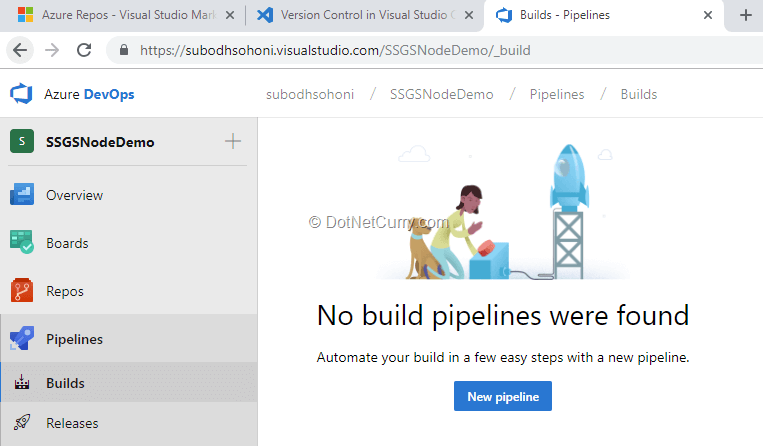 You can create new build pipeline by clicking the ‘New pipeline’ button. In the process of creating a new build pipeline, you will need to select the source repository. After that, you can select the template for the creation of basic build pipeline which you can customize as required. Since there is no standard template available, I suggest you use “Empty Job” and add the tasks as needed in the workflow of the build pipeline. 1. NPM task: Set its operation property to install. This will detect the dependencies from package.json and install all the dependencies on the agent. 2. Copy files task: This task copies all .js and .json files to the artifact. Two questions arise here, what is an artifact and why are we copying these files to that artifact when we are going to have a .ZIP package that we are going to deploy. 4. Publish Artifacts: This task will publish the output artifact with a name “drop”. This will be available to Release Management service for deployment. Save and Queue the build and once the build is ready, take a look at the Artifact. It should contain the NodeApp.zip file with the .js and .json files. Before you do the deployment, let us now consider how you are going to test your application once it is deployed on the Azure App Service. 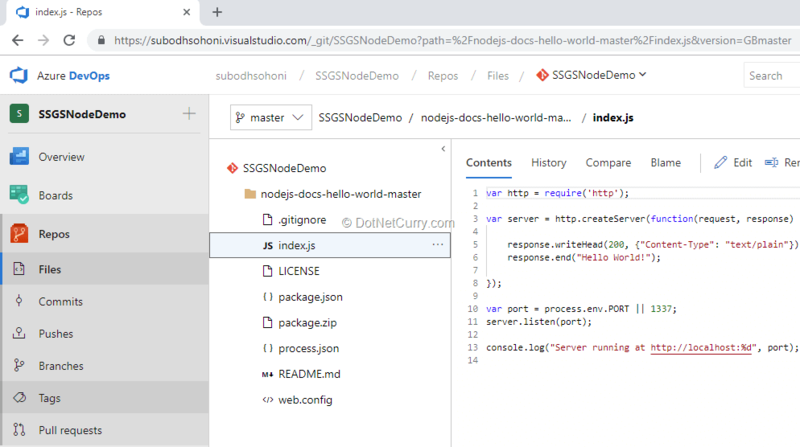 I suggest using Mocha framework to check whenever the required URL https://ssgsnodedemo.azurewebsites.net is requested, it returns a HTTP status code 200 as response and contains the words “Hello World”. Mocha has functionalities for checking status codes, but does not include asserts for checking the containing strings. The “Chai” assertion library can help you do that! We can now add a Mocha test. First add a directory named test under the source root and then add a file named test.js to it. You can find the code for the actual test in the screenshot below. Note that the base_url is the URL of the app which we are going to deploy on the Azure App Service. You will want to add a reporter to the Mocha test, so that a report is created in an XML file that can be then picked up and used by the “Publish Test Result” task in the release management. I suggest you use JUnit formatted test results file which is understandable in that task. For doing so, install the mocha-junit-reporter module. You will notice that by installing these modules in VS Code, we have automatically changed the package.json file to reflect all dependencies. In this file, you will need to add a script to run Mocha test. That script line should have a non-default timeout of 10000, as well as configuration of the mocha-junit-reporter. A result file named test-result.xml will be created when the test runs. Now you need to deploy the package to Azure DevOps. 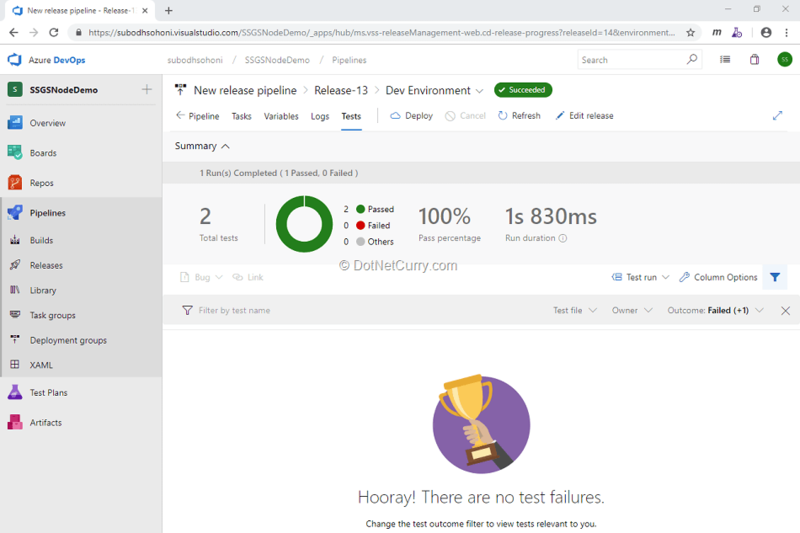 For deployment and testing the app, you will use the Release Management service of the Azure DevOps. Start by creating a new Release pipeline. 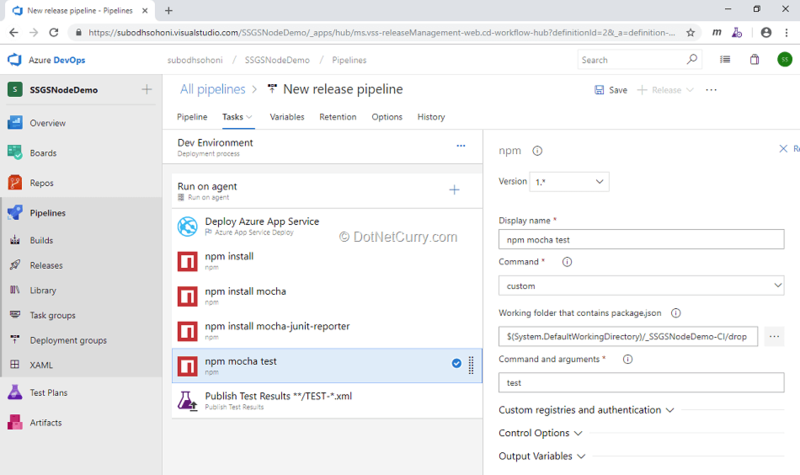 Use the “Deploy a Node.JS app to Azure App Service” template to create the first stage which you can call as the Dev Environment. Select the artifact that was created by your build pipeline and ensure that it always picks up the latest version. 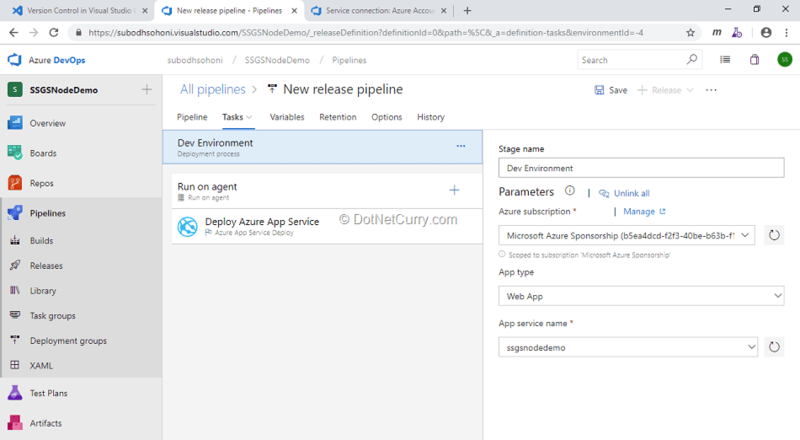 Connect this pipeline to your Azure account and the target App Service (web app). This task is sufficient to do the deployment but you also need to run the Mocha test that we have configured. For this you need to install all the dependencies that we have configured in package.json on the agent. Add a task: “npm install” just like we did in the build pipeline. 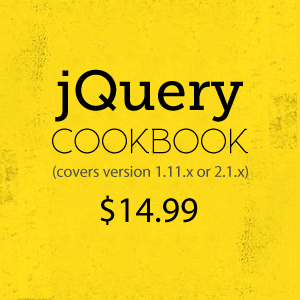 This task will install all the dependencies that are configured in package.json. In my experience though, Mocha and other libraries do not get installed with it. I prefer to add npm tasks explicitly to install mocha and mocha-junit-reporter. I suggest that you also do the same, but feel free to experiment with it to check if npm install task installs all the dependencies. The next task is to run the Mocha test. In the “npm task” select “Custom command” from the dropdown and then provide “test” as the argument. This task will run the Mocha test as well as create the test-result.xml file. This will be created in the test folder under the working directory on the agent. The test result that is created will need to be published to Azure DevOps. Use the task “Publish Test Results” for that. Select JUnit as the test result type since we have configured the reporter for that type. You don’t need to add any further changes in the task. When you create a release, it will automatically start the deployment. After deploying the application, it will run the Mocha test and publish the results. You can now click the “Tests” tab to view results of the tests which are imported from the test-result.xml file. You may also view the actual web page by opening the URL https://ssgsnodedemo.azurewebsites.net in the browser. 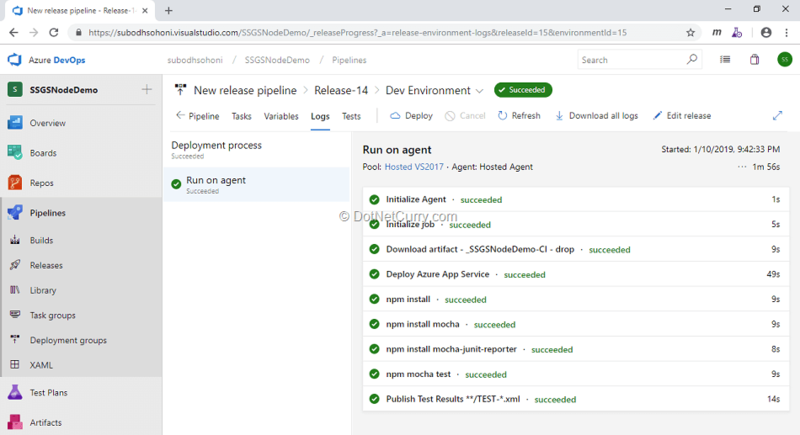 Use pipelines service of Azure DevOps to do the build, deployment and testing of that app. It is built as a .ZIP package and then deployed to Azure App Service as a web app and finally tested with Mocha framework. The next article is about using Azure DevOps for NodeJS application optimization using Gulp.